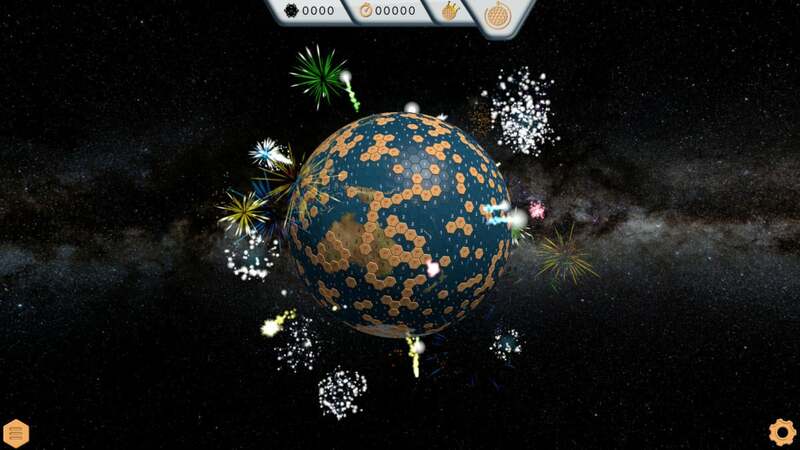 There's so much work to be done but I just can't stop playing Globesweeper, a spherical take on Minesweeper. February has been, if not a brilliant month for games, at least a busy one. I managed to finish and review Metro Exodus, Far Cry New Dawn, Crackdown 3, and Anthem in the span of about two weeks, and that’s not to mention the games we didn’t get around to covering yet—Astroneer, Tannenberg, God Eater 3, Devotion, NITE Team 4, Ape Out, and...Globesweeper. Oh, Globesweeper. I can’t quit you. I need to, because I have so much work to get done, but I keep click-click-clicking away into the wee hours of the night. Turns out ye olde Minesweeper is still incredibly addictive when done right, and Globesweeper does it very right. I can’t imagine you need the rules to Minesweeper explained, right? Like Tetris, it’s one of those games it seems like everyone, even those who “don’t play games,” has played. Doubly so in the case of Minesweeper, given it was packed in with every version of Windows from 3.1 up to Windows 8. Then Microsoft hid it away in the Windows Store which, let’s be honest, is tantamount to death. Okay, so if you came of age in a post-Windows 8 world, maybe you do need the rules explained. It’s pretty simple, in any case: You click on a tile, it tells you how many of the neighboring tiles are hiding mines, you mark the likely candidates, then you clear the presumed “safe” tiles and cross your fingers. Provided you’ve deduced correctly, you’re faced with another set of numbers and the cycle continues. Mark, reveal, mark, reveal, mark, reveal, until either every mine is safely flagged or you click the wrong tile and it all explodes. It’s straightforward, it’s mindless, and it’s extremely easy to fall headlong into the loop. But there’s a problem, or at least there’s been a problem in the past. Minesweeper addicts will know the pain of the click-and-pray moment, a.k.a. where Minesweeper stops being a game of logic and becomes a game of chance. Especially on the larger boards, there’s usually a point (or multiple points) where the player doesn’t have enough information to make an informed choice. Sometimes it’s a corner tile surrounded by mines, leaving you with no information at all. Most times though it’s a stalemate where two tiles each have a 50/50 shot of a mine, and you need to blindly guess which is safe. Early in the game these moments are annoying. Late in the game, they can be rage-inducing. Enter Globesweeper. 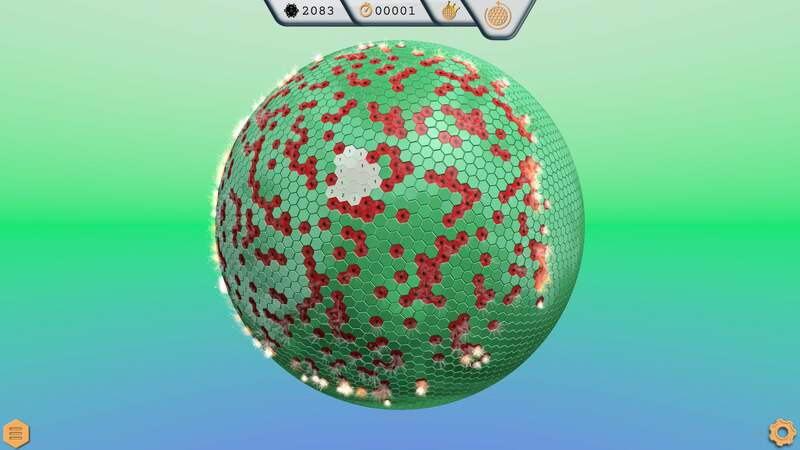 Pretty self-explanatory: It’s Minesweeper, but on a globe. 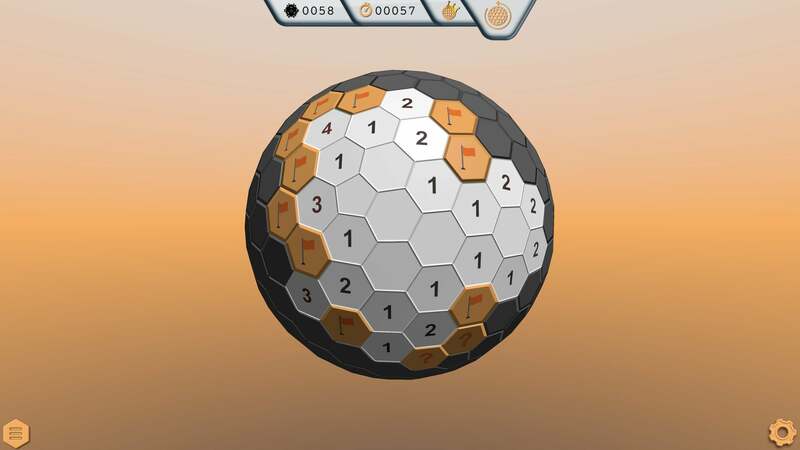 The default mode uses hexagons, meaning each tile can touch up to six mines, and the board is tessellated around a sphere like some sort of million-sided dice. Why? Well, in theory it cuts down on the amount of guesswork. Those click-and-pray moments usually crop up on the edges of the board, because there’s less info to work with. Sticking with the traditional Minesweeper squares for instance, a central tile is surrounded by eight others, and thus has eight data points for the player to analyze. A corner tile has three. Get rid of the edges, and you make it so every tile has the same number of data points—six for hexagons, eight for the alternate “Classic” or square mode, and twelve for the mind-bending triangle mode. But it didn’t cut out guesswork entirely, and at release I found myself frustrated by guesses-gone-wrong, especially on the “Colossal” spheres. To give you an idea: These globes include nearly 2,000 mines on the standard density, and there’s an achievement for beating one in under 52 minutes. Yes, an achievement for finishing in just under an hour. I still haven’t gotten that achievement. With that many mines a make-a-guess moment is almost bound to crop up though, and you can imagine how frustrating it is to get an hour into a Colossal sphere and realize it’s down to luck. I walked away for a few days. Then this week the developers added in a “Guaranteed Solvable” mode and sucked me right back in. This setting, which certifies a board is solvable sans-guessing, isn’t unique to Globesweeper. There have been other modern Minesweeper versions that outlawed guessing. 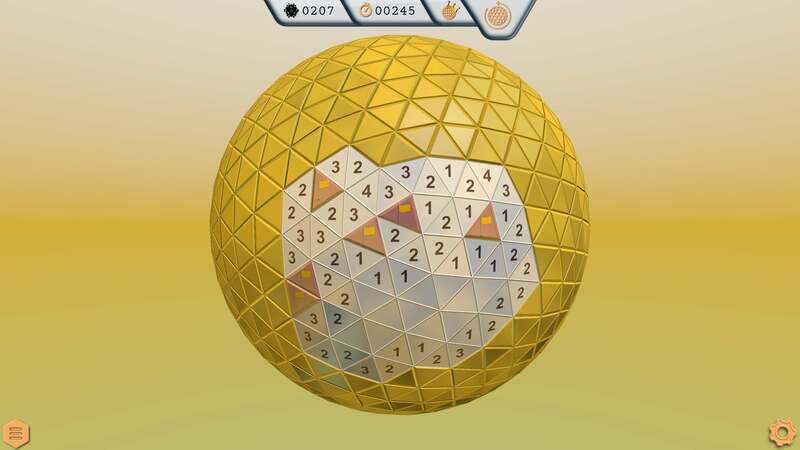 Combine it with Globesweeper’s unique presentation and the massive Colossal spheres though, and I’m finding it impossible to stop playing. Every time I need a break I find myself loading it up, tagging a few hundred mines, and watching the globe slowly turn into islands of orange-flagged mines amid broad swathes of cleared tiles. There are some neat customization options. One lets you skin Globesweeper with the same pixelated numbers and gray tiles as the classic Windows 3.1 Minesweeper, which is neat combined with the modern 3D view. Another lets you turn the globe into our globe, a satellite render of Earth, which you slowly uncover with each click. And while I’ve mostly stuck to the default hexagons, the aforementioned square and triangle modes are intriguing as well. Squares are most likely to appeal to purists, as that’s the traditional Minesweeper experience. 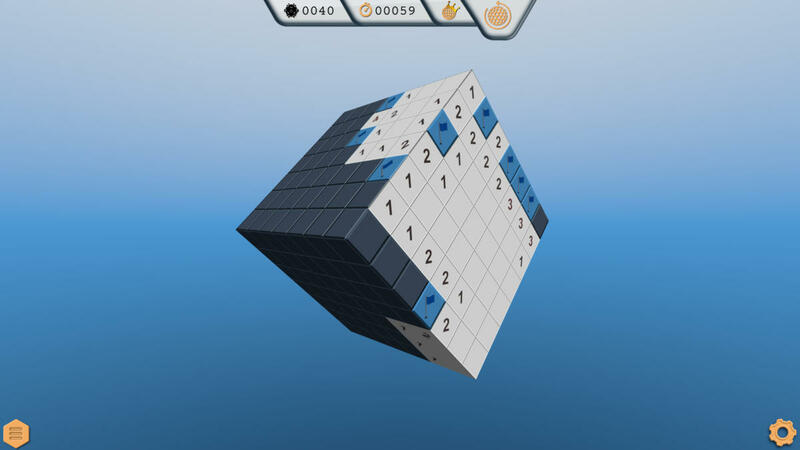 You can play that mode on either a standard cube (the default) or a spherized cube, the latter warping each tile to fit the globe. Triangle mode is, in my opinion, the hardest. Each tile touches twelve others, some of which are only corner-to-corner or corner-to-edge. Trying to read the board at a glance is daunting to me, even after a few successful rounds. Globesweeper is a great package. Sure, a modernized take on Minesweeper isn’t going to change the games industry, nor is it likely to show up on our end-of-year accolades. But I can’t stop playing it, and that’s enough to (in my opinion) make it worthy of a write-up. Like Pictopix in 2017, it’s just a well-built take on a tried-and-true puzzle game, and sometimes that’s all you need. Now if you’ll excuse me, I have 1,822 mines left to flag before bed. 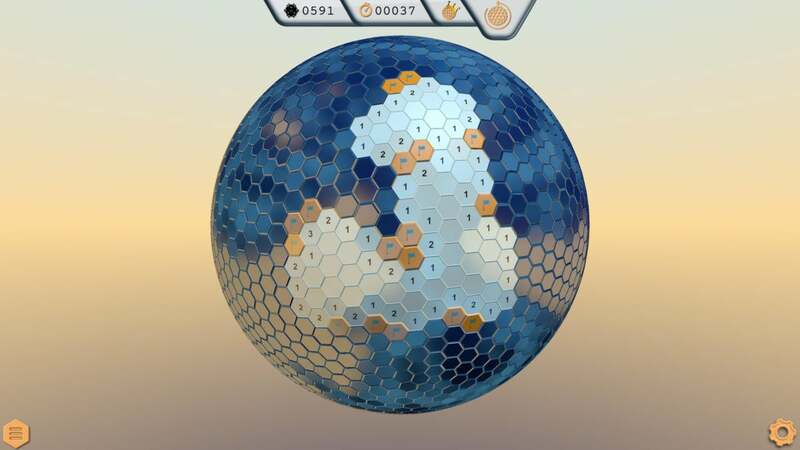 Globesweeper isn't going to change the games industry or anything, but we can't stop playing this spherical and guess-free take on Minesweeper.